Here's last week's comic for Investing.com. If it seems like I haven't posted one of these in quite a while, it's because I haven't. There was some scheduling difficulty, which lead to a hiatus. The comic (as per usual, conceived by the good folks at Investing.com and drawn by yours truly) deals with the debate over the Affordable Care Act (Obamacare), the debt limit, and the Tea Party. In case you're not familiar with the situation, the Republican Party in this country (and more specifically the ultra-right wing faction of the Republican Party known as the Tea Party) hates the Affordable Care Act. Even though it's been implemented as a law, the Republican party refused to raise the debt limit (which is basically America making good on money we've borrowed) until the A.C.A. was repealed. Raising the debt limit is absolutely essential, as it directly influences the credit worthiness of the U.S. The strategy was ill-conceived and eventually failed, but not before it lead to a partial government shutdown lasting two weeks, costing 24 billion dollars, and further eroding Americans' faith in the government's ability to do even the most basic job of governance. So, that's the skinny on this comic. 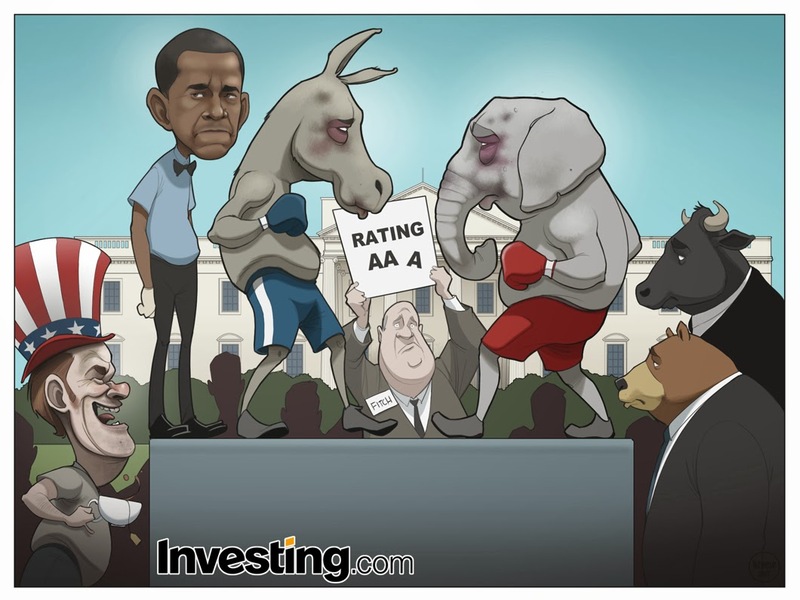 I was asked to draw a donkey (the traditional symbol of the Dems) boxing an elephant (traditional Rep symbol), Obama standing nearby, the bull, bear and a Tea Party member spectating, and a representative of Fitch (a credit rating agency) holding a sign up displaying America's tenuous credit rating. Everyone but the Tea Party guy was supposed to look dismayed. 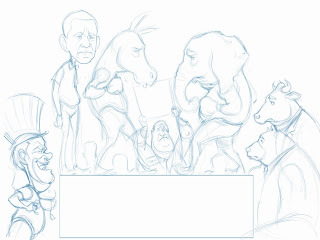 My favorite parts: Drawing the donkey and elephant beat up. I don't draw facial trauma all that often (you'd be amazed at how seldom clients ask for it), and it's pretty fun. It lets me put color and detail into faces that I rarely get to include. I also really like the way the Tea Party character turned out. He looks like a crazed hillbilly, which was super fun to draw. 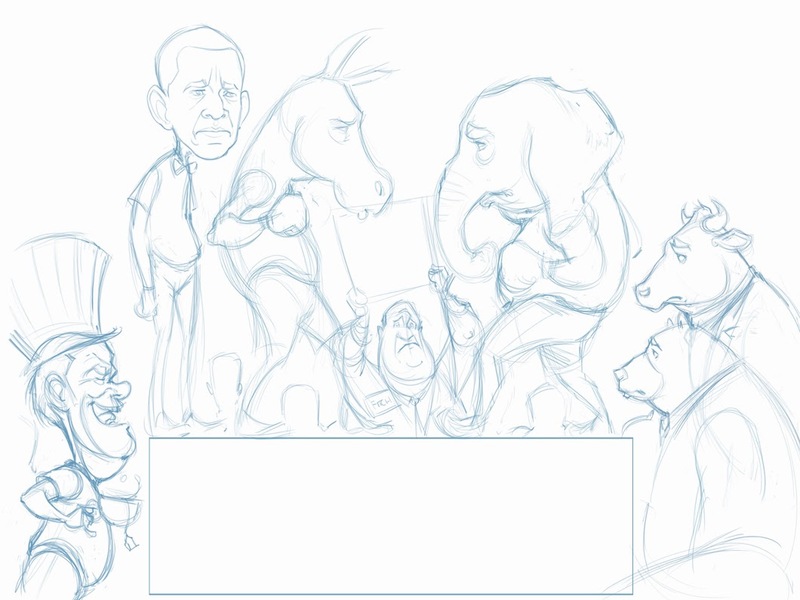 Finally, I've never drawn Obama's frowny face before, which was good fun. Least Favorite Parts: I hate drawing crowds. It's a pain and it never looks right to me. I should just develop some crowd templates that I can use over and over, but the problem is that you never know what the composition is going to be. The crowd can only be seen through gaps in the foreground, so the crowd basically has to be drawn custom every time. I also wish I would have included the ropes on the boxing ring, but I ran out of time (this one took me a LONG time to draw) and I was afraid the ropes would block too much of the background detail. All in all, I'd give this comic 4/5 stars. I'd give the government zero.